A major challenges facing the world is achieving global food security. Sustainable Development Goal (SDG) 2 – Zero hunger, seeks sustainable solutions to end hunger by 2030 and to achieve food security. The goal is to ensure that everyone everywhere has enough good-quality food to live a healthy life. For South Africa, the Bill of Rights states that “every citizen has a right to have access to sufficient food, water and social security” and that “the State must take reasonable legislative and other measures, within its available resources, to achieve the realisation of this right”. Achieving both the national development goals and Global goals (SDG) will require adoption of latest Earth Observation (EO) technologies for providing actionable information useful for improving the productivity and incomes of small-holder farmers, promoting sustainable food production systems and resilient agricultural practices. 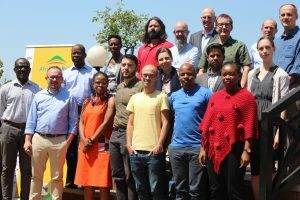 The South African National Space Agency (SANSA) has joined forces with a number of African and European partners to develop space-based EO solutions to advance food security and agriculture in the African continent through a H2020 funded project (774652), namely; Enhancing Food Security in African AgriCultural Systems with the support of Remote Sensing (AfriCultuReS). The AfriCultuReS project aims to design, implement and demonstrate an integrated agricultural monitoring and early warning system that will support decision making in the field of food security. The project will deliver a broad range of climatic, production, biophysical and economic information, for various regions in Africa. AfriCultuReS applies geospatial science to sustainable agricultural development, natural resource management, biodiversity conservation, and poverty alleviation in Africa. Apart from contributing to the overall project aims, SANSA leads the demonstration and users’ appraisal activities for the project. 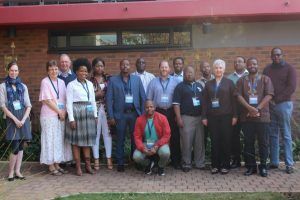 Earlier in 2018, SANSA held a Users’ needs assessment workshop attended by a range of South African stakeholders from Council for Scientific and Industrial Research (CSIR), Department of Agriculture, Forestry and Fisheries (DAFF), Department of Water and Sanitation (DWS), Department of Science & Technology (DST), South African Weather Services (SAWS), GeoTerra Image, Eastern Cape Department of Rural development and Agrarian Reform, First National Bank (FNB), Agricultural Research Council (ARC), AgriSA, AgBiz and Mobbisurance. The workshop identified the South African information needs and priorities, essential for incorporation into the service design and development.